The artist Tressa Sularz teaches a variety of fiber art workshops. She is available to design a class specific for any group interested in learning her unique or traditional techniques. Learn how to twine a 2-dimensional weaving created for hanging. 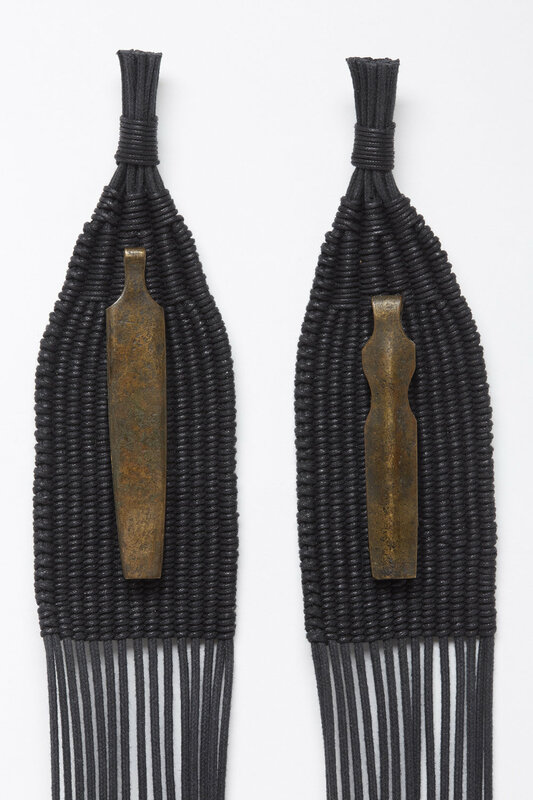 The woven piece is created to house your precious object which you will attach to the woven piece. You should finish one piece in class, and perhaps begin a second. Many times people have precious objects they store in a drawer or box; jewelry, buttons, small wood carvings, hand-crafted items. Going through our drawers we might all find treasures that apply to the weaving as a ‘home’ for such found objects. We’ll be working with cotton cords, and you’ll receive bobbins for your excess cord. This weaving will be approximately 2-3” wide and approximately 26” long, including the hanging warp unwoven cords. You’ll receive full spools of warp and weaving material and a choice of weaving color. Students should bring with them a journal for notes, tape measure, sharp small scissors, a bag lunch. Twining is one of the four basic basketry techniques. Learn how to twine a base, move up the sides with shaping, and finish an offering bowl woven entirely with cotton in your own shape, color, and size. This workshop is designed for the beginner level, but experienced twiners are welcome to join. Technique, form, and color are emphasized. This workshop will provide students with the basic knowledge to work independently with this technique, while also preparing you for more advanced levels of study in basketry techniques. During the workshop, students should have time to finish one offering bowl and may have the time to start a second. Materials fee $28, payable to the instructor. Learn how to twine this wall piece that dances on the wall. OK, not really dancing on the wall, but when hanging on the wall it looks like a dancer. This is a fun project, and will help you with other twining projects when you learn a new way to begin a project. We’ll discuss other options for another project. Glass beads are woven into this structure make it look like a fancy dancer. This is a fun class, and for those twiners you’ll be inspired to create in a new way.